Rain's Garden: Living The Porch Life! Yesterday I was up just after sunrise because I guess my mind was looking forward to the sunny warm day ahead and I couldn't sleep! When I took the dogs out in the morning it was still near zero though, but it warmed up pretty quickly as the sun rose. 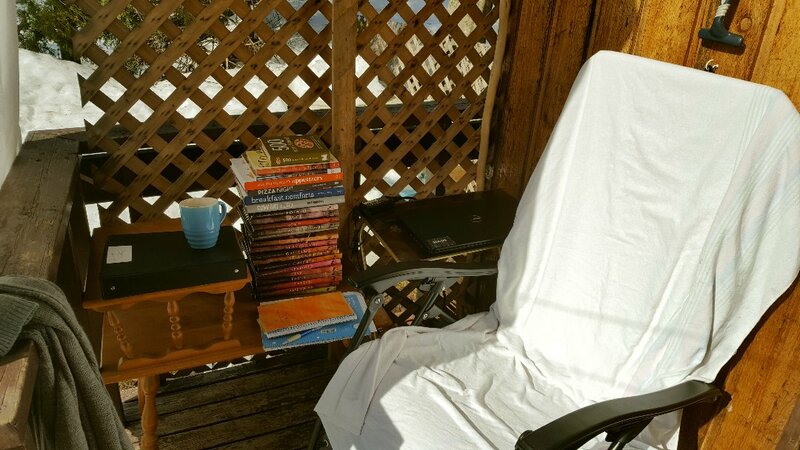 Since my monthly shopping day is coming up next week, I thought I'd bring all of my cookbooks outside and start getting some ideas for meals. 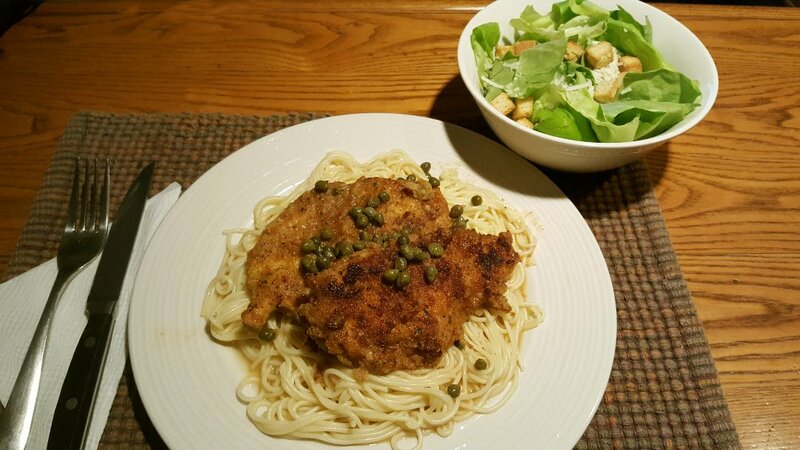 For dinner I made Chicken Piccata with a nice fresh salad made with Boston lettuce - I love that mild taste of the Boston lettuce so much! Dinner was fabulous! Remember the burned Cheese Nips??? The company NEVER got back to me after 3 emails, 2 forms filled on their website and a post on their Facebook page. Talk about irresponsible! So I wrote an email, sending pictures to the Canada Food Inspection Agency. The government got back to me within 30 minutes, forwarded the file to the Quebec office and they got back to me yesterday. I just sent the woman the photos and information on the box. She said she will be sending me a form to fill out and once she receives it, she'll make a trip here to pick up the box and the leftover crackers. After that she's heading to the store where I bought them to see if there are other boxes from the same "lot number" for analysis. She said the whole process could take months, but that they take the complaints very seriously, especially when a company ignores the complaints. I guess by the end of the summer I might find out what happened! I got my sprout seeds in the mail! I'm going to look up how to sprout them using jars and hopefully get that going today. I remember really enjoying alfalfa sprouts when I was younger, I'd eat them right out of the container, they were so fresh and crunchy. 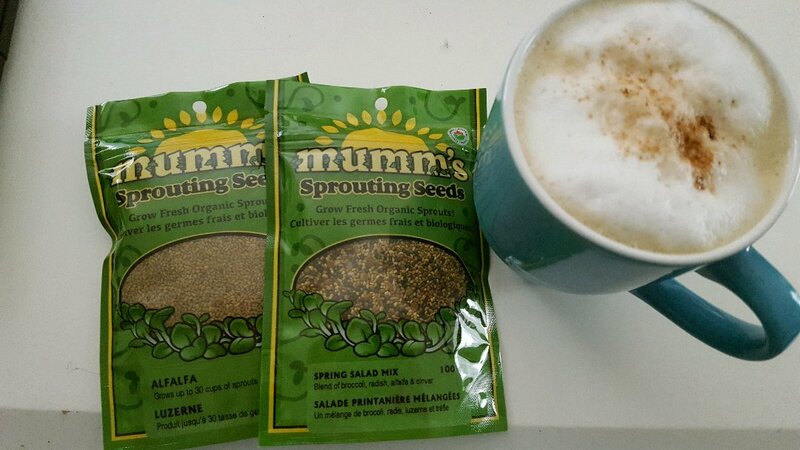 I haven't found a grocer that carries fresh sprouts these days so I'm going to try sprouting them myself. I'm hoping this will be something we really enjoy so that we have some salad greens more available all winter. Alex and I talked about the garden, the crappy food from the grocery stores and how we just want to be less reliant on companies. He mentioned that he loves cucumbers...go figure, we've been together four years and I didn't even know that!!! He said it's one of his favourite veggies in the summer. A cuke and tomato sandwich - fresh from the garden. I didn't buy the seeds because I didn't think I'd find the room, but I want him to enjoy the garden harvest just as much as I will, and I found a bush variety that I can put in a large container. Since I wanted to save on shipping, I decided to go for it again. I got seeds for ground cherries and radish as well. I've never been a radish fan, I find them too spicy. Alex likes them, though they give him heartburn. I found an "Amethyst" variety that apparently has a milder flavour, so we're both up to trying them. We're hoping that our fresh veggies will be easier on our digestion than the ones we have to buy now. Oh, and the ground cherries? Just because. :) This will be an experiment like the pumpkins. We had a thunderstorm yesterday evening. Our poor husky Marlene didn't fare too well...we're still working on that issue. After it was all done though, there was so much fog that we decided to walk by the river. We could actually hear the river and waterfall from our backyard. Monday nights, the village is a ghost town and we really enjoyed the blue foggy quiet evening! So glad you got in some porch time! I need to set up a little area for myself in the back away from prying eyes! LOL! Look at all your cookbooks! But, I must admit, if I stacked mine I'd probably have that many and more. I want to garden but I also want to get up North where I actually can. 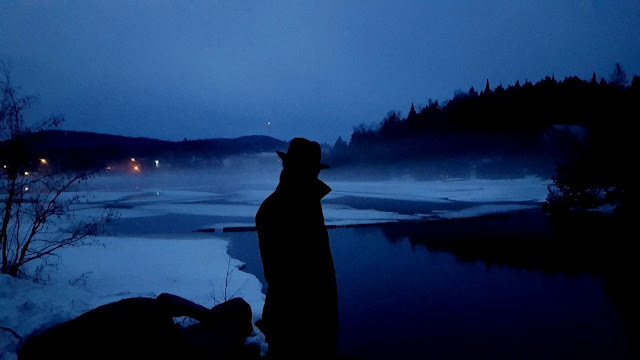 Your photo of the lake/river? is gorgeous! So glad you are enjoying the nice weather. I will be making your chicken picata and I love capers! Take care! P.S. Jack is so darn cute....those eyes just slay me! LOL! Oh, Jack! He knew what he wanted and apparently did a darn good job of communicating it to you without being able to use words! I do so admire the way you are jumping into gardening. Just wait until you taste your own homegrown produce. You won't believe how different it tastes than store bought. It will be so fresh!! We love cukes, too, and must eat at least one each day when they're coming from the garden. I refuse to buy them in the winter even from our organic co-op. They're yucky. (I'm sure it's because they're so old by the time they get here.) Oh, how I love radishes. You'll find they won't be too strong, bitter or funny-flavored if you can grow them quickly in the right conditions. They like cool weather, plenty of water, loose soil and sunshine. The longer they take to mature, the "woodier" and stronger tasting they get. Sounds like you are going to have a FABULOUS garden this summer! I've never been able to tolerate radishes either. I just leave them out of any recipe that calls for them. I'm glad the Maiden, Mother, Queen, Crone paradigm resonates with you! I understand why some women prefer it, but I'm still a Triple Goddess traditionalist, lol. Jack is a clever fellow! That's what our Tucker does...steals everybody else's toys! He's cheeky. Jack's eyes are adorable. Have you considered potato bags? That's what I grow my potatoes in. I just don't have the room for all the potatoes I grow so I bought bags. Best thing ever!! We got such a great haul of potatoes last year - I was happy. My favorite are any yellow potato. I usually buy the bulk box from Superstore and those do me quite well. Good luck with your sprouting! You will be pleased I am sure. We are big on emergency preparedness in our house and sprouts are in our emergency food tote. That would be the only fresh food you could grow quickly if you were faced with an emergency. I am the same with radishes. Too spicy! My husband loves them tho...I buy them for a treat for him occasionally. I have never had luck growing them. But I can grow parsnips like there is no tomorrow. Go figure. I am glad that someone is taking charge of the burnt cracker situation. How terrible of that company! That really makes me angry...you pay for a hopefully good product and then you get ignored if you have a complaint. Not nice. I hope you get good results! I got my coupons in the mail from my "buggy" lettuce yesterday. 3 free coupons and 3 $1 off coupons. Not too shabby! You had a thunderstorm!!!! I am SO jealous. We are patiently waiting for storm season! My husband is an amateur storm chaser so he's just chomping at the bit to get out there and chase tornadoes. Our husky did not like storms either. Or fireworks. He would freak right out. I feel so bad for them as you try to comfort them but they just don't settle. Hi Debra :) Thanks for responding, I feel like I'm a Queen at this stage of my life :) and I respect all the traditions. I've never been any type of purist, I say live and let live, as long as we're all feeling good about ourselves and our beliefs without harming anyone in the process. :) I hope my garden will be fabulous!! I'll be documenting it every step of the way!! Funny you mention your hubby's storm-chasing, I did that for a little while when I lived in the Eastern Townships near Orford. Boy oh boy did we have storms over there. It was incredible. My goal was to photograph lightning and I did manage to get some great shots from the safety of my car of course! We had a few tornado watches, but I think I'd be too scared to go out in that kind of weather! It took Marlene hours to settle down...poor girl! You know, Kymber suggested used tires for potatoes. I like that idea but I kind of got turned off when I went to the garage and only smelled cigarettes! Oh, Quebec...you do smell like an ash tray...but bags, no, I've never even heard of them! I'll have to look them up, and thanks for the suggestion for Heritage Harvest Seed, I'll look them up too. I currently get mine from William Dam and Ontario Seed Company - both in Ontario. Time will tell if the seeds are good or not, but so far the basil is doing well! :) I can't wait to start my sprouts! I'm just kind of sad that I had to actually go to the Canada Food Inspection Agency. I wonder if that company thinks I'm trying to get more coupons or something, it's so ridiculous. Anyway, it's now out of my hands so I'm trusting the government to school them. I remember doing the same thing back in 2011 when I bought a pack of veggie "chicken". I'd never eaten it and the taste was horrible, but I had no idea if it was bad or just tasted like that. My gosh, 3 days of the worst food poisoning pain...Loblaws ignored all of my complaints and I brought it to the Inspection Agency. After their investigation, they discovered more tainted veggie products because Loblaws didn't have a proper refrigeration on their display unit. I got no compensation except for the peace of mind that the government took charge and did something about it. Mind you, I never shopped at that Loblaws again. And thanks, the photo looks really nice, considering it was my Android!! I now consider myself extremely lucky in that I have never got a batch of bad crackers, ever! The cracker company, scoundrels that they are, may send you a year's worth of hand baked crackers just to get the cracker police off of their case. The pasta looks wonderful, you may have to put your own cook book out some day. Rain - i think the porch life really suits you! jambaloney does most of our grocery shopping on days that he goes in to work....once a week usually. but that's just to get little stuff. he does a big grocery shop only once a month...sometimes i go with him...sometimes not. i really do not like leaving our property. 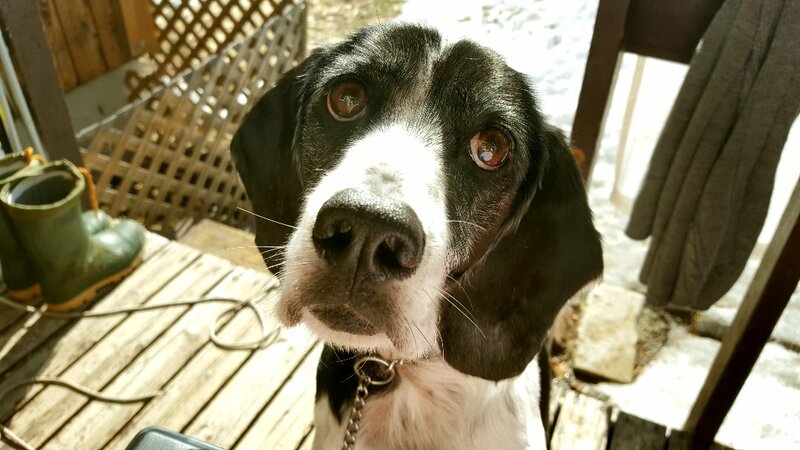 those big brown eyes are to die for! 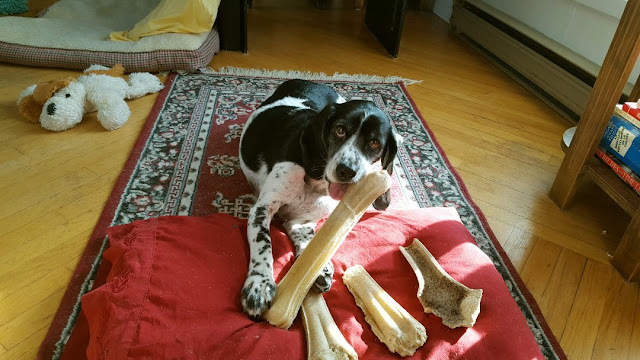 and good on Jack for knowing when it's time to gather up all the bones for his own little self! chicken piccata looks delicious and boston bib is so yummy! um...holy moley. 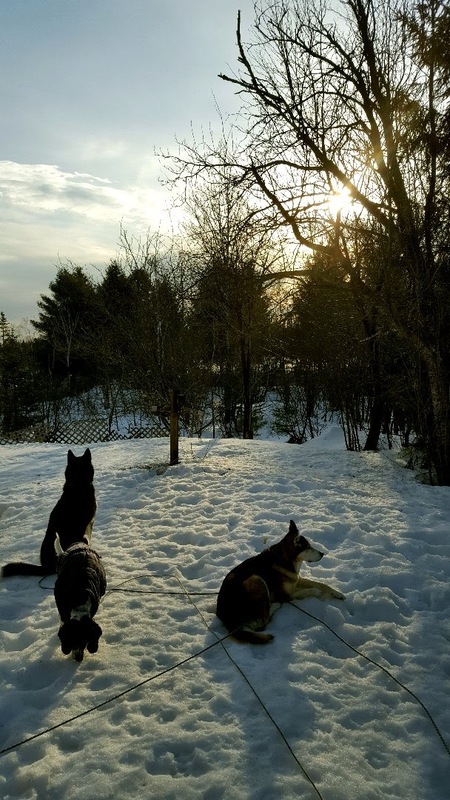 are you gonna have lab techs and the like out in your yard at all hours of the day testing soil, taking blood from you and alex and the huskies, perhaps running MRI's and the like? 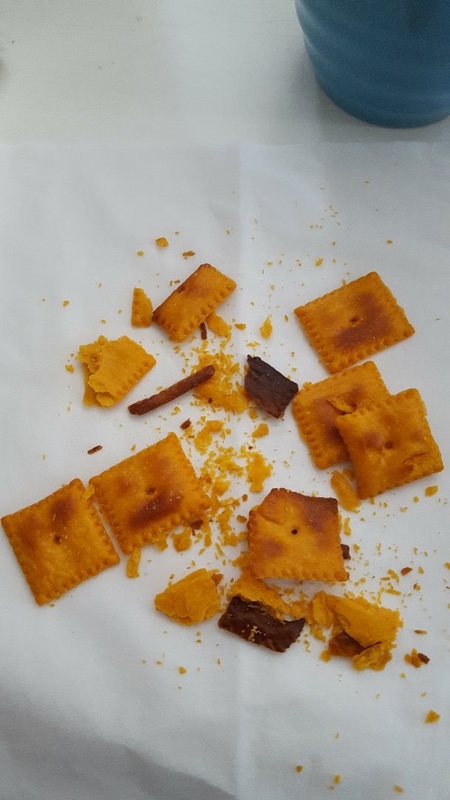 geez louise - all over some burnt cheezits??? you are going to have to keep us informed! this is a serious story that might need a book and a tv series - bahahahah! yay - sprouts! woohoo! you are going to love growing your own sprouts and trust me - we try our hardest to keep the sprouts for salads and sandwiches and it NEVER works - we just eat 'em as is...sooo delicious! it looks to me like you got your hands full of everything garden...you just plant what you can and do your best - that's all any of us can do! and you make sure to enjoy every single bit of food that you grow...it will make your ancestors proud! i am so sorry that Marlene doesn't like the storms...i had a black lab growing up who couldn't stand rain/snow or lightning storms...imagine a 100lb black lab trying to get underneath the couch during storms. i always wrapped willie in a blanket and kept him on my lap for as long as the storm lasted - sometimes i got to sleep...sometimes not. i love the pic of alex by the river and the bluey-purpleness of it all. Rain, I find it so funny that you sit out on the porch with snow on the ground. You are made of far sterner stuff than I.
I love walks in the fog. Your garden will be fantastic !!!! I got some porch time in yesterday too. It was in the low 60's here. And I got a motorcycle ride in. Your food always looks amazing. I had our 17 year-old make dinner last night. She did very good at it too. Hi Kymber :)) Thank you, I think the porch life suits me too! I prefer not to leave the property ever as well. But groceries need to be bought, really though, that's probably the only time I don't mind, and that's why I'm trying to make it happen only once a month! I can't wait to get the sprouts going! I didn't have time yesterday but I will try today! I can't see myself waiting to eat them either lol...I wish some sun would come out a little to warm up my seedlings by the window. I'm keeping them nice and moist but they do need sun. After today's downpour, the weather looks pretty good! I can't wait to start all of my outside garden plans. I already feel proud that I'm taking this step and not waiting until we buy a property! Oh gosh, so many dogs have that problem with the noise. Marlene is like that with fireworks or any loud noise. When we first got her and there was a thunderstorm in the movie we were watching, she'd start to get nervous. Her fear is pretty bad. I have to find some money to buy her that thundershirt, people have told me it works very well! Hi Kristina :)) Thanks! I try really hard to make the food look as good as I anticipate it will taste :) It must have been nice to have someone else cook for you. I know I appreciate that when Alex offers! Good for you - going to the 'top' with your food complaint. You gave the company more than enough opportunity to come clean. Unless we all stop waiting for someone else to make a difference, nothing will change. Oh, Jack. Those eyes. I would be absolute putty. He reminds me of my dear Scrappy - that same kind of moo-moo eyed look and the meaningful glances at the treat cupboards. Boy, do I miss him. Have you looked into square foot gardening? It is a great way to grow lots of food in a small area. When I first started my garden, I had one raised bed and planted it in the square foot method. It turned out great. Living on top of solid rock, I've had to be resourceful with my planting. I grow my potatoes in both bags and tires with good results. The bags are nice, as you just dump them out when you're ready to harvest, dust them off, fold them and store them. P.S. That is quite a stack of cookbooks you have there! Love the last photograph - it's almost the picture of quiet. Thanks Susan :)) Most of the time I don't have the mental energy to fight with any company or customer service agent...Alex is my rock when it comes to that. But he's so busy with his work so I found my courage to do it! Awww...Scrappy, that's a great name! :) That's exactly it, meaningful glances! At night, Jack sits right next to me on the bed and stares at my night table. In the drawer is his mint/vanilla doggie toothpaste. He knows what "do you want to brush your teeth?" means, so we went into code. Alex started saying "did you B his T?" But he understands that now too lol...He loves the toothpaste! I have heard of square foot gardening, I haven't looked into it too much at this point, thanks for the suggestion! Oh, and I did look up growing potatoes in bags yesterday too and I'm now looking more seriously into that! I like the tire idea too. Maybe once we move, I can get some old tires and really take the time to clean them and fix them up so my phobias don't bother me so much, the ones offered to me from my mechanic all stunk of cigarettes. Rain - all the tires need is a good washing with some environmentally-friendly soap and a good rinse with the hose. tires are wonderful for potatoes in our northern clime because if they are outside with dirt and compost in them, the blackness heats up the dirt quicker than a regular bed or raised bed and you don't have to harvest them until you get several hard frosts in a row. we don't fully harvest our potatoes in tires until late decemeber! and 2 tires stacked 4-high will give you a nice potatoe harvest without taking up much room. i have "The All New Square Foot Gardening" book - would you like me to send it to you? just send your address to me at kymberzmail@gmail.com and i will send it to you.